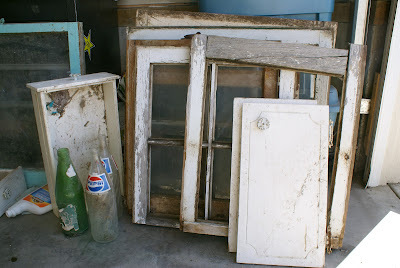 I also scooped up these windows from the 1930's ~about to be demolished~ home in Scandia Alberta Canada. And just when you think I might have run out of Vintage Window ideas....nope.....Here is another one! 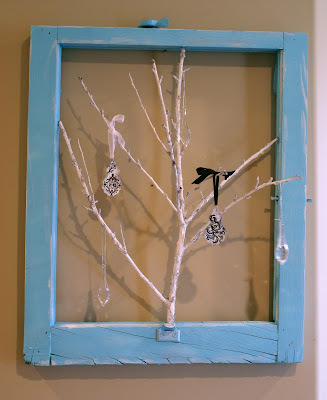 I painted the window Heirloom White, I also sprayed some twigs, and yes, random out of the yard twigs the same Heirloom White! I then hot glued them into the Vintage Window Frame. 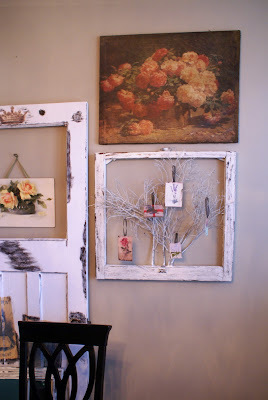 I printed some Vintage Images from my Favorite Graphics Fairy Website and hung them on the branches from Black Ribbon. What a great way to decorate seasonally! 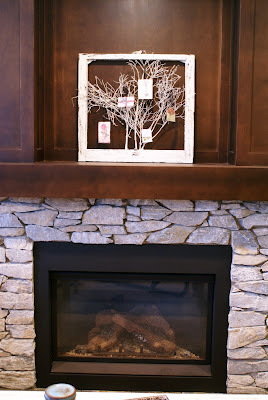 Here it is on my fireplace Mantle. This Creation is SO Eye Catching and Magical, the pictures do not do it justice at all. 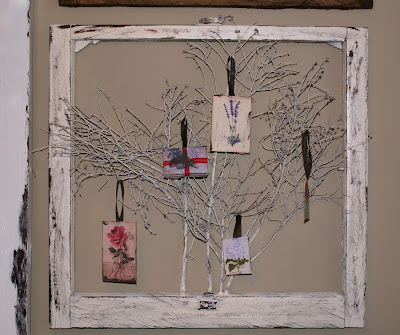 Here it is hanging on the wall in a grouping! 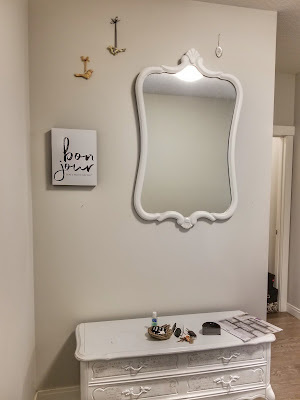 You can place it anywhere and it will get the conversations going! The first Creation found a home so quickly that, I HAD to Create another one! I painted this one Aqua Blue, and painted the Branch Glossy White, the contrast is so Enchanting! I hung small glass crystals from random branch pieces. Again this could be decorated seasonally. Tune in again on Monday for Part 3 of the Scandia House Creations! Super Gratitude for Tuning In!